We were at a launch party for “Suffer No Fools,” a new PBS documentary, when a guy asked us if he should get the latest Kindle or the new iPad Mini. This is a tough question – and he was a tough-looking guy. We praised the virtues of the Kindle “Paperwhite.” It has a soft light for reading at night, but you can also take it out into bright sunlight. It’s a dedicated e-reader, so you’re not tempted to check your mail instead of reading your books. 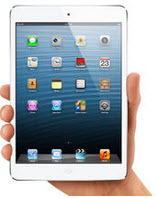 It has a touch screen like an iPad and is 30 percent lighter than the iPad Mini. It’s a lot cheaper too: $119 instead of $249 for the iPad Mini, or $199 for the new Kindle Voyage. But despite the numbers, reality often works out differently. We love our iPad Mini. We have the older Kindle and the Kindle Fire, but we rarely use either now. The iPad Mini is so versatile: we like to switch from reading a book to reading our mail, and even though we could do this on the Kindle Fire, we don’t; it doesn’t feel natural. Our newspaper and magazine subscriptions are in living color, which is also true on the Kindle Fire, but not the Kindle Paperwhite. At night the iPad Mini can be switched to white text on a black background, which is easy on the eyes. Ironically, a few years back, Joy bought a Kindle for her brother-in-law, convinced he would stop using his iPad 2 for reading books once he discovered the joy of the Kindle. We don’t think he ever took it out of its box. This Kindle thing may not turn out to be a winner.